I have seen quite a few pie fights on video, and I just found my favorite. It is from a Little Rascals theatrical short called “Shiverin’ Shakespeare”. What makes this one different? Use of slow motion. Sometime it’s during the throw, sometime on the hit. Just the variation in speed makes it interesting. When the pie flies in slo mo, then hits at full speed, it seems faster. Editing. This one has a nice pace of editing. With fun reaction shots of the kids. The actors, when entering the fight, move with a slow deliberateness that is just funny. It’s almost like the slower they move, the funnier it is. The first man who buys a pie stops to weigh them in his hands. It still has all the usual pie fight elements like the matronly woman getting hit, and the wide shot of pies flying in all directions. I recently finished reading A History of the Hal Roach Studios written by Richard Lewis Ward. Hal Roach, for those who don’t know, was a motion picture producer who operated a studio from the silent era to the dawn of television. He was one of the most successful producers of comedy ever. His actors included Harold Lloyd, Stan Laurel and Oliver Hardy. It was his idea to put Laurel and Hardy together, and he created the Our Gang/Little Rascals series. This isn’t really a book review. The book was what I expected it to be, which is a history of the studio and it’s operation. It’s about show business, not about art or comedy. I find show business to be an interesting topic, but many people would not. I wouldn’t want to bore anyone with details, but I recall some interesting bits. Hal Roach met Harold Lloyd when they were both in a holding room waiting for work acting as extras for movies. At the time Hal told Lloyd his plans to become a film maker, and to hire Lloyd. Harold Lloyd was his only money making star for a long time. He had Stan Laurel and Oliver Hardy on separate contracts. And their renewal dates were never in sync. This made it very difficult for L & H to break away to another studio or out on their own. 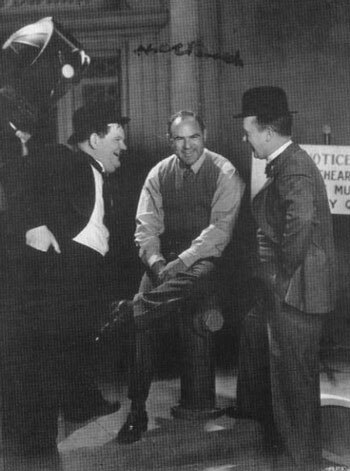 Stan Laurel was the creative energy in the partnership and If Laurel started to walk, Roach immediately planned work for Hardy without Laurel. Roach attempted to partner Hardy with Harry Langdon , but the results were a failure. Stan Laurel didn’t get anywhere on his own, and returned to the studio. The last item is a bit of trivia, but I found it interesting. As children in The Little Rascals started to grow too old for their parts, plans were made to replace them. The new player would join the gang for a few pictures before the previous one was retired. That way the gang was a fluid group, and the audience didn’t notice a sudden change in the line up. The technique avoided the sort of situation the Three Stooges had when Curly dropped out and we were given a succession of replacements. Hal Roach had a combination of good business sense, and good luck. Obviously he had many successes, but the book was more likely to give numbers on how much money was lost on which productions. Several times the studio came close to ruin. I guess financial losses are more dramatic. Reading it leaves me wondering how they stayed in business at all. The hits must have outnumbered the flops, though. Obviously it is a stressful way to make a living, and it’s good to recognize how difficult it is to be a successful producer. Eventually Hal Roach let his son Hal Roach Jr. buy out the company and try to make it in television production. He did poorly, and wasn’t able to pay off the debt to his father. Hal Roach Jr. died at 52 years old. Hal Roach Sr. lived to a hundred. Here is the first part of a two part interview with Mr. Roach.